LOGANSPORT, Ind. – Kokomo advanced to the championship game of the IHSAA Class 2A Logansport Girls Soccer Sectional after a dominating 3-0 win over arch-rival Logansport. Kokomo, which finished tied for second in the North Central Conference, will play NCC champion Marion in Saturday’s 1 p.m. title game. 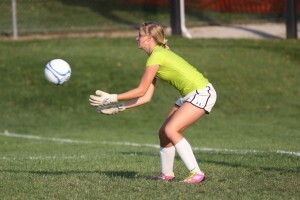 The Lady Giants knocked off Kokomo 4-1 earlier in the season. Kokomo scored all three of its goals during a 10-minute stretch of the first half, and dominating ball possession the entire game. Cheyenne Eltringham got the Kats on the board in the 20th minute off a pass from Addy Takacs. Five minutes later, Takacs collected her second assist as she took the ball up the left side and crossed it in to find Holly Stewart crashing in to make it 2-0. Spencer Wesche finished the scoring with a direct free kick that she placed in the upper left corner of the goal. Becca Wade scored the shutout in goal with 10 saves. This entry was posted in Kokomo, Lady Kats, Sectionals, Soccer. Bookmark the permalink.